Austrian pianist; born at Prague July 4, 1852; studied under Höger, under Krejci at the Prague Conservatorium, and under Kullak at the Neue Akademic der Tonkunst, Berlin. 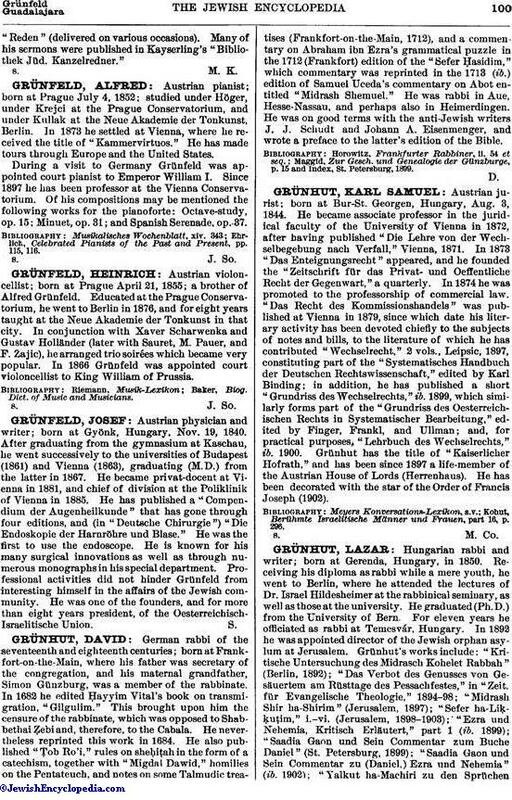 In 1873 he settled at Vienna, where he received the title of "Kammervirtuos." He has made tours through Europe and the United States. During a visit to Germany Grünfeld was appointed court pianist to Emperor William I. Since 1897 he has been professor at the Vienna Conservatorium. Of his compositions may be mentioned the following works for the pianoforte: Octave-study, op. 15; Minuet, op. 31; and Spanish Serenade, op. 37. Ehrlich, Celebrated Pianists of the Past and Present, pp. 115, 116.